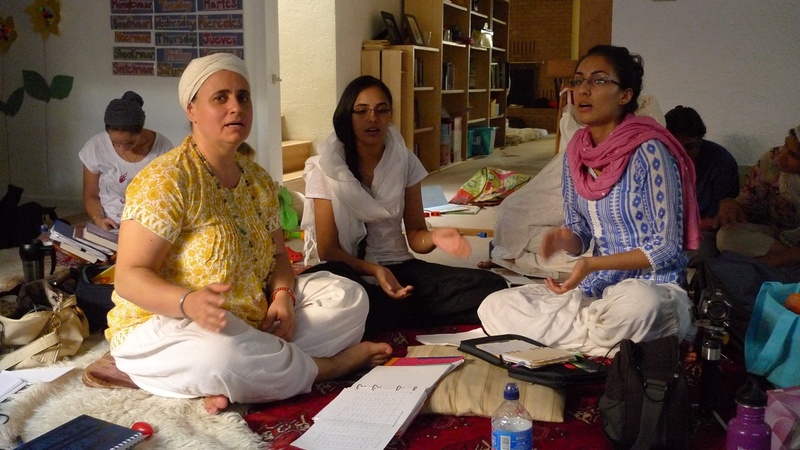 The kirtan course started with the students gathering and reconnecting. Those that arrived early helped with the shopping and set-up. The group had been invited to sing at the Albuquerque gurdwara so the first morning was spent preparing for the sangat. 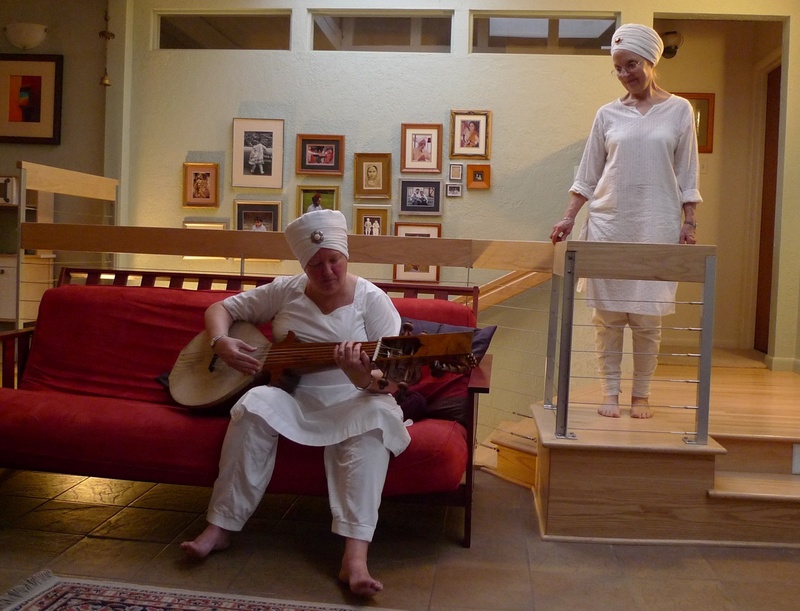 That evening Bhai Baldeep arrived and after carrying the newly crafted rabāb by hand from India to Italy and then New Mexico, he presented the beautiful instrument to Harbhajan Kaur. She immediately began playing the rabāb and the two became close companions for the remainder of the course. During the kirtan course the daily schedule begins at 5:00 am with morning riyāz. Sur practice with scales and exercises in various rāgas strengthens the voice and increases fluency. One new student asked why we do this practice and I told him it was the same reason Michael Jordan would shoot more than 100 free throws every day even during the height of his career. Every endeavor requires a mastery of the tools of the trade, a continual honing of the craft. After the morning break for breakfast, rest and housekeeping, the class resumes at 9:00. One group meets for singing and another group meets for percussion. Students share what they have learned with each other. Sometimes it is the young people who teach the older people. The presence of the teacher, Bhai Baldeep, ensures that there is plenty of new knowledge shared, review, refinement and correction of previous learning, and plenty of laughter. 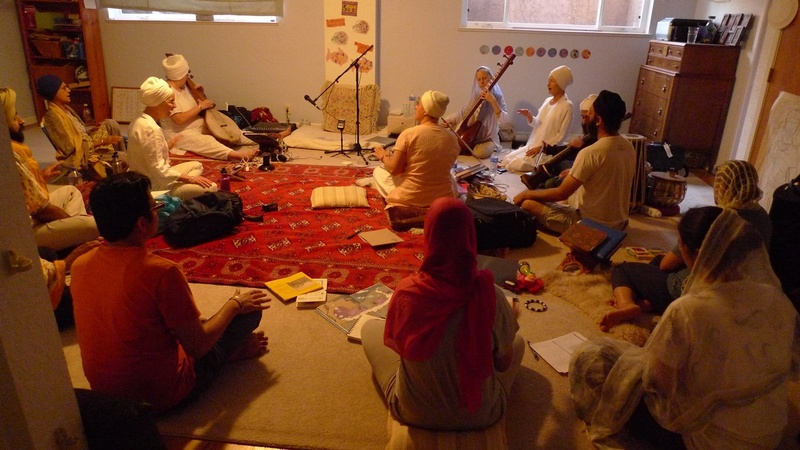 Along with musical practice, information and inspiration is given so understanding of the path of kirtan can grow. After the midday lunch break, class resumes in the late afternoon. Sometimes the instrument practice continues into the late evening. Life is farming, after death is harvest. If you’ve got the roop of the rāga in your mind, anything you say will be rāga atmak. When you go into orchard of rāga you pluck a few flowers for a reason for your bouquet. Kirtan is the prime jewel of meditation of Guru Nanak. Aural tradition, then oral tradition. Every new generation must re-learn the intangible heritage in order to re-live it. Every rāga is a village or a home, with a few people in it and each soul has a heart, mind, thought process. Each note is a person, how does each respond to a particular topic? Each tān is a thought. How does each note attend to it? Learn the ability to withdraw ourselves from the expression, only then the Guru’s expression can occur. We have mal, we carry dirt, our own accumulations, it’s trash…We don’t learn how to sing a song, we learn how to not interfere in a song that already may exist. We learn how to subtract, to remove ourselves. That is unique about gurbāni versus other bānis. The purpose is different. Let the rāg happen, in that moment transcend. Nād yoga carries chit, the whole being high, not just vocal cords go up. Cleanse the vehicle and hitch a ride in it. With what face do we present to the Guru when we sit in the Guru’s court? Kirtan doesn’t make you a musician, it makes you a sādhu. Sing the meaning, live the text. We must attend to the text, it is our guru (it is different for dhrupadia and khyāl singer). My mind must be bathed in today’s hukam. Stretch notes one note at a time to increase range. During this retreat we visited more than a dozen rāgas. We learned new exercises and patterns for building skills. Practice of alāp revealed the sruti of the rāga, the movement of the rāga and the structure of alāp itself. All of the practice is a preparation to be able to sing the gurubāni and the shabds were delivered by Bhai Baldeep with sensitivity and awareness, music and meaning, accompanied by pakāwaj and strings. For me the classes reinvigorated the personal practice and were “magically” aligned with the focus I had been giving rāga tilang, the desire to stretch the vocal range, and the interest I had been cultivating to explore alāp practice. On the last evening students reflected on their experience and one word that was heard again and again was “family”. This group has become a kirtan family, bound by love for each other, love for kirtan, love for the One.